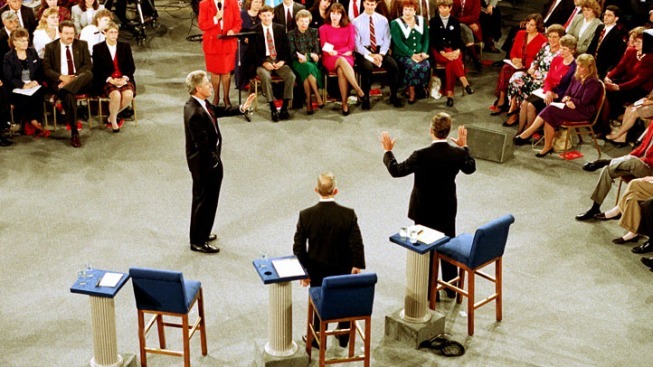 FILE - In this Oct. 15, 1992 photo, Moderator Carole Simpson, background center, presides over the Presidential debate between, from left, Democratic presidential candidate Bill Clinton, Independent candidate Ross Perot, center, and Republican candidate, President George H.W. Bush, at the University of Richmond, Va.
President Barack Obama and Republican Mitt Romney will take questions from a room full of undecided voters Tuesday night for their second of three face-to-face debate showdowns. The “town hall” style debate has become a staple of presidential elections -- and can prove a tricky format for candidates. The every-four-years ritual of a national town hall debate began as a nerve-racking experiment in live television in 1992. Moderator Carole Simpson was so nervous about turning over the microphone to regular folks and their questions that she spent days mapping out the presidential candidates and their issues on "a zillion 3-by-5 cards," in case she had to take over the questioning herself. "I was afraid these undecided voters from Richmond, Va., might get into this huge TV studio where they'd be seen by millions of people and they'd just freeze," the former ABC journalist recalled. "I wanted to be prepared." The voters didn't freeze up and the format was a hit. 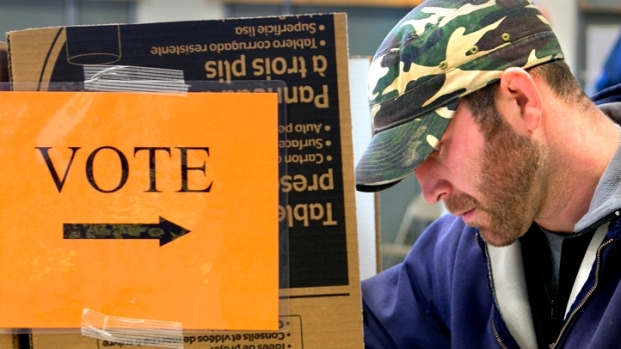 Since that first town hall 20 years ago there’s been one in every presidential election since. The sixth will bring Obama and Romney to Hofstra University on New York's Long Island Tuesday night to take questions from undecideds selected by the Gallup polling company. Gallup recruited the audience of about 100 Long Island voters from a random sample of Nassau County residents – those who either expressed no preference for Obama or Romney, or who may have a preference but said there is still a chance they could vote for the other guy, NBC New York reported. Debate coach Brett O'Donnell, who worked with John McCain in 2008 and Romney during this year's primaries, says: "This is the one debate that belongs to the people." Obama, especially, needs a forceful showing to recover from his leaden performance in the campaign's first debate. But he must tread carefully in an atmosphere more suitable for share-your-pain moments than aggressive attacks. "You can't have this sort of all-out slugfest at a town hall debate," O'Donnell said, so don't expect the fireworks of last week's Joe Biden-Paul Ryan vice presidential match. Viewers want the candidates to show respect for those voters in the room, who stand in proxy for all Americans. "You've got to connect with the person who's asking the question — look them in the eye," said Robert Denton Jr., head of the Communications Department at Virginia Tech. "It's about empathy and connection." Romney comes to the arena strengthened by his first debate. And the people-first format gives him a unique chance to overcome a persistent weakness: suspicion among some voters that he's too wealthy to relate to the middle class and the poor. But if Romney fails to engage with his questioners, he could reinforce that impression. That's what happened to President George H.W. Bush in the first televised town hall debate, a low moment in his failed 1992 re-election bid. The three-way contest at the University of Richmond between Bush, Democrat Bill Clinton and independent Ross Perot stands unmatched as an example of the format's risks and rewards. Bush was thrown by a woman's oddly worded question: How had the national debt personally affected the candidates? He stumbled through a meandering response, asked the woman to clarify and ended up sounding irritated and a bit argumentative: "Are you suggesting that if somebody has means the national debt doesn't affect them?" Even worse, just as she began her question, TV cameras caught Bush checking his watch. That gesture would be replayed over and again as evidence that the president was indifferent and out of touch. "I took a huge hit," Bush said years later. When Clinton got his shot at the same question, he set the standard for town hall emoting. Clinton crossed the stage to stand before the woman, locked her in his gaze, and recounted the economic pain he'd personally witnessed as governor of Arkansas. "He just burst through the TV set," Simpson recalls. How did that first town hall come about? Not surprisingly, Bush had resisted the risky new idea. But Clinton pushed it in negotiations with Bush and the Commission on Presidential Debates because his campaign thrived on town hall-style events. "It's the flesh and blood of America, so I love those things," Clinton later told Jim Lehrer of PBS. "And I loved that one." Bush told Lehrer he hated debates, period. Because candidates are free to walk about, town halls are body-language danger zones. In 2000, Al Gore was ridiculed for striding unnaturally close to George W. Bush as his rival spoke. Bush deflected Gore with a surprised look and curt nod, to audience laughter. In 2008, comedians emphasized McCain's age by ridiculing the way he seemed to wander aimlessly about the stage while Obama talked. Then there are the questions. They tend to be more straightforward and less pointed than those that journalists ask in debates. But they can be unpredictable. And while debaters often dodge a moderator's question by veering off to some other talking point, it's less acceptable to treat a citizen's query that way. In 2004, President George W. Bush took heat for failing to come up with a specific mistake when a woman asked him to describe three wrong decisions. That town hall also tested the format's more civil tone with sharp exchanges over the Iraq War. John Kerry labeled Bush's campaign a "weapon of mass deception." Town halls have lost some of their spontaneity. Voters chosen for Tuesday's event must submit their questions in advance and moderator Candy Crowley of CNN will decide which people to call on. She can pose her own follow-up questions. In 1992, questions weren't screened beforehand. Simpson walked through the audience Oprah-style and a producer signaled which person to talk to next, seeking a good demographic mix. She had no idea what each person might ask. "They were not the questions the media had been focusing on," said Simpson, who now teaches journalism at Emerson College in Boston. "They were asking about bread-and-butter issues that they were interested in — the education in their schools, the crime in their neighborhoods, the economy and jobs." "We're still talking about the same things — the deficit, jobs, outsourcing," she said. "We'll probably hear some of the same subjects Tuesday."